The Stage 1 IHI BatMoWheel turbo is a great upgrade for your LB7 Duramax. The compressor wheel has been replaced with a BatMoWheel from Bullseye Power and the exhaust housing has been modified to allow the fixed geometry turbo to breathe better. 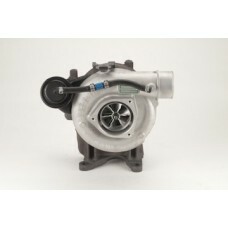 This turbo is a drop in replacement, no need for expensive pedestals with this turbo! This turbo has produced 552rwhp and 1073ft lbs of torque on the dyno.